To get to the Darkside, you must first reach the End. Walk the western-most stretch of Greenpoint Avenue—a Polish neighborhood in northern Brooklyn best known for its recurring role in HBO’s Girls—until you reach the last warehouse before the green space that fronts the East River. 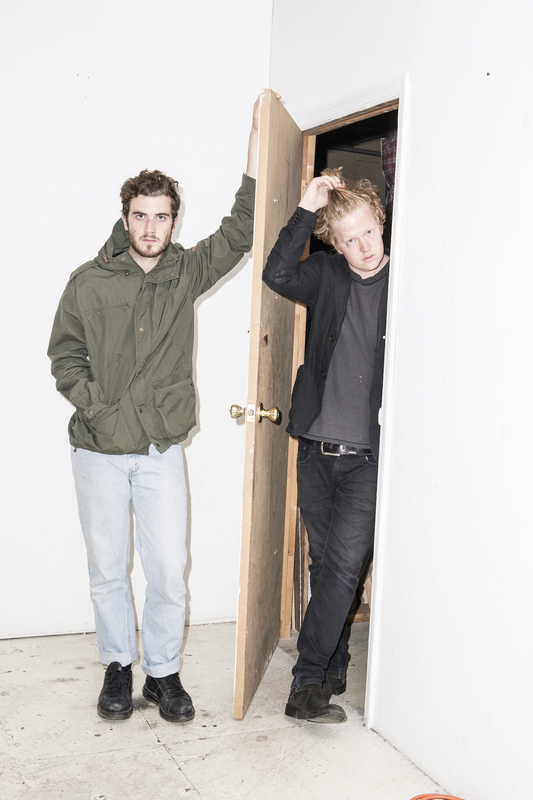 This is the End, a “full-service creative facility” that also serves as the rehearsal space for Darkside, the latest preoccupation of producer Nicolas Jaar and his foil, guitarist Dave Harrington. Once inside, the narrow, snaking corridors—lined with stacked drums and paintings—seem to be soundtracked by eerie organ music. Climb the stairs to the reception area, and the organ chords grow louder, closer. Up a few more steps sits Harrington, 27, slouched over a Hammond Rhythm Rail organ in the corner of this room, his ginger bangs dangling down, his gaze intent over the depressed keys. He’s soon joined by Jaar, 23, who wanders over to the left side of the keyboard; with one hand, he forms a chord on the bass notes that harmonizes with Harrington’s off-the-cuff playing, and the drone of the Hammond suddenly darkens and grows more ominous. For Jaar, it’s the shadowy sound he prefers as of late. After years of making music under his own name, he’s now pushing his solo work aside to support Darkside’s debut album, Psychic, released earlier this fall. 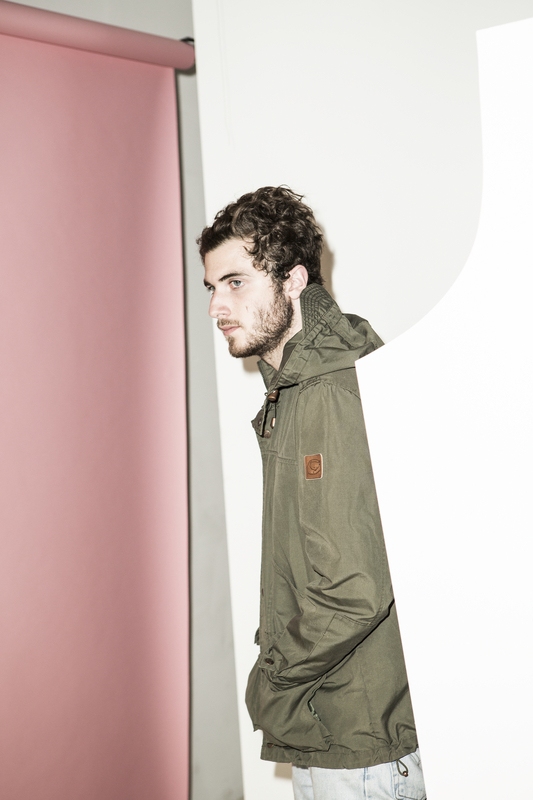 Nicolas Jaar’s auspicious musical path was star-aligned from the start. He is the son of Chilean conceptual/installation artist Alfredo Jaar, and his mother, Evelyne Meynard, studied dance at Merce Cunningham’s studio. He grew up between Santiago, Chile, and New York City. Near the time of Jaar’s 14th birthday, his father gave him a copy of Thé Au Harem D’Archimède, the 2004 triple album by minimal techno mind-expander Ricardo Villalobos, a fellow Chilean expat. Jaar has been vocal about the antecedents for his music—be it the peculiar French pianist Erik Satie or the swinging Ethiopian composer Mulatu Astatke—but it’s easy to trace the influence that Villalobos’ immersive, consciousness-warping music must have had on the teen’s impressionable mind. Mizrahi invited the then 16-year-old to one of Wolf + Lamb’s loft parties at the Marcy Hotel, a dilapidated space overlooking the elevated J train in South Williamsburg. “Nico was pretty shy, but he always had confidence,” adds Mizrahi. “I remember asking him to try adding more percussion to make [his songs] more playable in a dance-party environment.” Not even a few months later, Jaar returned to play his first live set at the Marcy Hotel, setting the ambiance at a Wolf + Lamb party. Jaar’s earliest productions felt as taut and open-ended as a Villalobos track, spacious and slow to unfurl yet carefully constructed. On “The Student,” from 2008, a squeaky door and rustling papers cohere around a closed hi-hat and a beat that could have been tapped out on a rain barrel, before a saxophone and wordless vocals warm up the track. If anything, Jaar proved a quick study. The next year, he began releasing more of his own music, as well as that of friends and classmates on his own Clown and Sunset imprint. (He now steers a new label venture called Other People with the help of DJ Justin Miller.) While studying comparative literature at Brown University, Jaar put the finishing touches on his much-praised full-length debut, Space Is Only Noise, released in 2011. After crafting his tracks in isolation for some three years, Jaar started assembling a live band to take on tour. He knew he wanted to work with friend, fellow classmate and saxophonist Will Epstein, who suggested recruiting bassist Dave Harrington. Despite initial hesitations—Jaar already handled the low end himself—Jaar considered the potential of a bassist playing guitar in his music and set an audition for Harrington. As Jaar sips an iced coffee and fidgets—his jean jacket the same hue as his blue eyes—Harrington, dressed in head-to-toe black, methodically draws on an electric cigarette. Harrington’s energy seems less intensive than Jaar’s at first, but he’s every bit the music obsessive. Earlier, they discussed their favorite albums. Harrington waxed rhapsodic about having his whiskey neat while listening to Tom Waits’ Alice at 3 a.m., though Jaar opts for Rain Dogs. They went out for a drink at Greenpoint’s River Styx, where one of Harrington’s favorites, Steely Dan, played overhead. It was the early 2000s, the tail end of jazz as the hipster soundtrack in New York City, before indie rock and electronic music took hold of everyone’s attention. Harrington says he went off to Brown in 2004, and by the time he returned to NYC in 2009, that way of playing music was all but eradicated from the landscape, with venues like Tonic and the Cooler shuttered and the Knitting Factory relocated across the East River. “All my jazz-musician friends in NYC were dabbling in indie rock, so I ended up in a kind of synth band,” Harrington says. “My friends who were holding out for jazz at the time were not very happy, but my friends who submitted to other things—like, I was subbing in a metal band—could do two or three gigs a week.” When an offer came from Jaar, Harrington showed up to audition with a borrowed guitar and set up alongside Epstein on saxophone, drummer Ian Sims, and Jaar on keys and electronics. “It didn’t work the first hour, but I didn’t really expect it to,” remembers Jaar, who eventually toured Space Is Only Noise with this core group. “It was more for me, honestly.” He wanted to assemble his band to play live without the music turning into Ibiza jazz or trip-hop. During shows, they would experiment with how Jaar’s sound could mutate: One night, Harrington unleashed a gnarly guitar drone. The next night, Jaar wanted that drone to growl for longer. Soon after, Jaar began to strip away everything except for the guitar, moving Epstein to a keyboard and jettisoning the drummer. But even that wasn’t enough. For Jaar, whose solo effort was earning accolades, the duo was his only way forward. 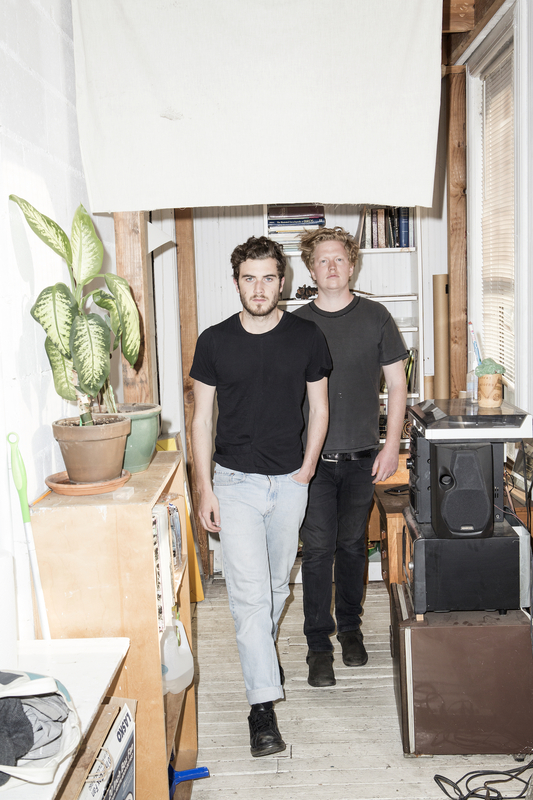 Back in Brooklyn, Jaar and Harrington quickly began writing and wood-shedding for what comprises Psychic, their psychedelic debut. The 11-minute opener, “Golden Arrow,” starts with a gloomy organ tone and a crackle of electronics. Harrington’s guitar saws like one of Arthur Russell’s electrified cello lines as Jaar conjures and banishes electronic washes. Slowly, a song starts to arise from the dark ambience. Jaar cracks a sly grin as he discusses the album. “The beginning of the record is an open door that says, ‘Come in; it’s a nice little house.’ Maybe there’s a dead body in the house, but you’ll figure it out later.” Harrington’s guitar lends the quicksilver electronic music a serpentine quality, the album always shifting in tone and texture. At times, the duo favors lo-fi distortions; other times the programmed beats and guitar lines are lucid and clear. A slow-burn like “Paper Trails” evokes the bent-string noir guitar of Marc Ribot or a Twin Peaks twang. Soon after Psychic was completed, Jaar and Harrington were suddenly musicians with time on their hands. The two hung out in Brooklyn bars, where the replay of Daft Punk’s inescapable summer anthem “Get Lucky” caught Jaar’s ire. “I don’t get this song; why is everybody singing it?” he remembers saying, as Harrington nodded to the strength of the track’s Nile Rodgers guitar riff. It’s a few days later, and Darkside is again at the End. Now the two are intent on getting the album tracks ready for live performance, but it’s a rough day. The studio space is filled with sunlight, and the air is hot and still; sweat gleams on both their faces. “I’m worried about the interior of the song,” says Harrington, a Gibson Midtown Semi-Hollow strapped to his chest. He pulls at his e-cig. Jaar is unshaven, a wool cap on his head, oblivious to the heat. They are working out “Paper Trails,” so they try it again. Harrington’s guitar spires around Jaar’s keyboard line. When he triggers the propulsive kick drum, everything tightens. Harrington begins to multiply guitar lines into loops, and Jaar’s synth swells thicken the air in the room. The song is just about to levitate when one of Harrington’s pedals malfunctions.